Modes or Quadratures are three groupings of the signs by the category of force they typify (or their seasonal position). They are: Cardinal (dynamic, active, powerful, intense), Fixed (latent, firm, resistant to change, stable), and Mutable (adaptable, harmonizing, changeable and flexible). Planets in the same quadruplicity are square or opposed to each other and in tension with each other. If you are looking at a Natal Chart that I wrote for you, look under "Balance of Modes" to see if the modes are balanced, strong or weak in your Natal Chart. If your Natal Chart indicates that the Elements are balanced, THAT'S GREAT! Then read all the Elements qualities below to see what they indicate. If I wrote you natal chart, I indicated the elements and the modes in the first few pages under the section called, "Balance of Modes" (fixed, cardinal, mutable) and "Balance of Elements" (air, earth, fire and water). 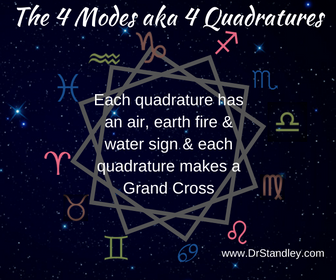 Note below that each Mode (Quadrature) is made up of one air, earth, fire and water sign. What you may find interesting is that a Grand Cross (aka Grand Square) is made up of the Cardinal, Fixed or Mutable signs. The cardinal signs are just like the points on a compass. Aries, east; Libra, west; Cancer, north; Capricorn, south. These 4 signs are called cardinal signs because they are the first signs in each season. Aries, spring; Cancer, summer; Libra, fall; Capricorn, winter. The changes of season are due to the Sun's "apparent" change of angular distance or, "in reality," the tilt of the earth according to its location in its orbit. If you are born in a cardinal sign, you are more than likely versatile, adaptable, and fully capable of adjusting yourself to changing conditions as they occur. Cardinal expresses energy actively and seeks challenges. The basic essence of cardinal signs is survival. You prefer to follow in other people's footsteps rather than initiate actions. You can be relied on to come up with the "Goods" as long as someone else has the initial ideas. Your survival mechanisms could use some strengthening. This is a self-esteem thing! Don't be afraid to initiate action. Your self-esteem may have been dealt quite a blow, but that was then, this is now. You already have the "Goods" and you really don't need anyone else to come up with the ideas for you. You enjoy challenge and action, and may become frustrated when you have no recourse for change. You expect others to also rise to a challenge. Hey! What's up with the expectation on others? First of all, it is the challenge that stimulates YOU and a challenge may not be what stimulates others. And because you enjoy a challenge you must have some idea that you have recourse for change, even if it does mean accepting people or situations as they are. That would be a change, wouldn't it? It is what it is! Since you have the innate ability of adapting to new and changing situations as they occur, then do it. The fixed signs are associated with the middle of the season. If the cardinal signs bring us into a change of season, then the fixed signs see us firmly centered smack-dab in the middle of those seasons. If you are born in a fixed sign, you are more than likely set in your ways and more fixed in your views than those born in cardinal or mutable signs. You are likely to have more continuity and be more difficult to sway, change or move from your position. You rarely change your mind, and are not so quick to adjust and adapt to new situations. You can't teach an old dog new tricks. Fixed expresses itself by wanting to remain stable and secure. The basic essence of fixed signs is growth. You like to flit from one thing to another, finding it difficult to settle down. You enjoy change, although you lack the stability needed to see things through. Organizing or scheduling will help. Now there's nothing wrong with bouncing around here and there if you are getting your "stuff" accomplished. If you are running late, then it probably impacts others. If you misplace papers, then it probably impacts something else. And then there is the domino effect. Keep a schedule, write it down, make a list and stick to it as best you can. You'll get triple the amount accomplished when you become more organized. To you, the best environment is a secure and stable environment where you know exactly what is going on. You do not enjoy change. You expect others to be reliable, just like yourself. When it comes to expectations, live up to your own expectations rather than requiring someone else to live up to yours. This could be a control issue. How about you live your Natal Chart and let others live their's. Change is Good and change is often. Change can also make you more aware of opportunities and advantages when you are more open. Your joints will also feel much better when you are more flexible. Mutable signs are the last months of the four seasons. The mutable signs finish up with the duties that are common to the season and begin to prepare for the change in the next quarter. If you are born in a mutable sign, you more than likely have attributes of both the cardinal and fixed signs and can adapt to the nature of both those signs. Incidentally, the cardinal and fixed signs may see you (the mutable sign) as being somewhat unstable, when in reality, you are a chameleon. Mutable expresses itself by wanting to be flexible and adaptable. The basic essence of mutable signs is adaptability. You may find it difficult to adapt to new situations. You tend to be inflexible when faced with the demands of change and other people. Being open and flexible to new and changing situations could thrust you forward and open new opportunities for you. The more space you give yourself, the easier it will be for you to expand. Closing yourself off to new ideas and changing circumstances could very well limit you. You must continually create expansion in your Life by clearing things that no longer serve you. If something is merely taking up space, then it is taking up something else's space, thereby limiting growth. You may procrastinate due to your ever-expansive flexibility. You expect others to be flexible, like yourself. If you think about how difficult it may be for you to be fixed (stable) then it will be easier to see how difficult it may be for others to be flexible (just like you). Procrastination can be somewhat of a control issue, especially if someone or something else is waiting on you. If someone or a situation around you is fixed (stable) then this is probably because you could use some stability yourself. Embrace the fixed energy as a gift and try to incorporate a dose of it.